The wall against Route 21 is currently a stark white attracting attention by drivers-by... in a few weeks it will be transformed into the country’s second longest mural — approximately the length of 25 football fields. Rebecca Pauline Jampol will serve as curator for this epic, 1.39-mile-long mural. Stretching along the Route 21 (McCarter Highway) Amtrak retention wall, “Portraits” will be created by 17 highly-acclaimed local, national, and international artists. Their pieces will reflect the City’s rich and diverse culture, foster communal dialogue, and celebrate the arts, while beautifying Route 21 for the 1.1 million monthly-commuters who traverse the highway. As the City celebrates its 350th anniversary, the artists have designed pieces that pay homage to Newark’s history while also celebrating its present and future. 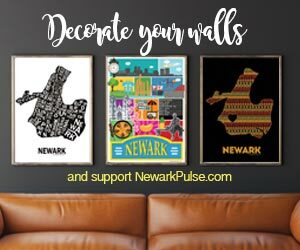 Coming from as far away as Brazil, and as close to home as Newark, the diverse group of male and female artists reflects the ethnic and cultural tapestry of the region. The work will be done nightly between 9pm and 6am since it requires closing a lane on Route 21. *Adrienne Wheeler (New Jersey, USA) is a multi-media artist, independent curator, arts educator, and advocate for social justice. She lives and works in Newark, NJ. Through her practice, Adrienne addresses the injustices that plague society, particularly those injustices affecting the lives of women and children. Current works in progress are papier- mache Njorowe or "Belly Masks", the body plate of an important female ancestral masquerade belonging to the Makonde People of Southeastern Tanzania and Northern Mozambique. *Akintola Hanif/HYCIDE (New Jersey, USA) is an artist living and working in Newark, New Jersey. His work is heavily rooted in cross-cultural photojournalism and documentation of quality of life. He is the founder and editor-in-chief of HYCIDE, a photography magazine dedicated to subculture, art, and conflict. His photography has been featured in such venues as the The Guggenheim Museum, RUSH Arts Gallery, Corridor Gallery, Aljira, a Center for Contemporary Art, MoCADA Museum, Princeton University, and the Metropolitan Museum of Art. *David D. Oquendo (New Jersey, USA) was born in San Juan, Puerto Rico and raised in New Jersey. His practice revolves around the development of a quasi-spiritual universe. In 2009 he completed his undergraduate degree at Rutgers University - Newark, earning a BFA in Painting and a Minor in Art History. Oquendo has shown work in New Jersey, New York, Florida, United Kingdom; as well as created murals throughout New Jersey, and New York. Currently, Oquendo is an arts educator through The Robeson Galleries at Rutgers University-Newark and an art teacher at Great Oaks Charter School in Newark, NJ. Don Rimx (Florida, USA) was born and raised in San Juan, Puerto Rico and currently resides in Miami, Florida. He received his diploma from the Central High School of Visual Arts and went on to continue his education at the Escuela de Artes Plasticas (School of Fine Arts). Don Rimx has participated in many notable mural projects and conferences that include Los Muros Hablan NY in Spanish Harlem, Urban Nation Berlin for the UN Museum for Urban Contemporary Art, and the Color Libre Puerto Rico mural project. This is his first mural in Newark, New Jersey. El Decertor (PERU) is from Lima, Peru. He is a painter interested in building weatherproof memories in public spaces. He began his career with no formal studies in art and his first inspiration came from portraits of the common man and woman that make up the human scenery of the Peruvian cities. His work has transcended his hometown borders and can be found in cities such as Cartagena in Colombia, Cochabamba in Bolivia, Mexico City in Mexico, Buenos Aires in Argentina, Azemmour in Morocco, among others. GAIA (Maryland, USA) is a New York native, currently based in Baltimore, Maryland where he completed his education at the Maryland Institute College of Art. His work confronts issues of environmental degradation, gentrification, immigration, segregation, and urban development. His studio work, installations, and gallery projects have been exhibited throughout the world, most notably The Baltimore Museum of Art, Rice Gallery, and Palazzo Collicola Arti Visive. His street work has been documented and featured in several books on urban art, including, most recently, Beyond the Street: The 100 Leading Figures in Urban Art (Berlin, 2010). In 2015, he was featured in Forbes 30 under 30 in Art and Style. This is the third collaboration GAIA has had with the City of Newark. *GERA (New Jersey, USA) is a cross-disciplinary artist raised in Newark, New Jersey and currently based out of Brooklyn, New York. Her family has a history in Newark, owning several businesses that are staples in the Ironbound section. She works using photo, video performance, books-making, and public art. GERA’s public art can be seen in the architecturally integrated art of eco-resin screens set into the bus shelters of BRIO, Sun Metro's new rapid transit system. Her studio work and public art work reflect the spirit of culture and dreams. Her work in the City of Newark will be a collaboration with her partner WERC. WERC (Mexico) is from Mexico and was raised in Texas. His work craft stems from a history in graffiti writing, as well as an extensive cross-media background similar to his partner’s Gera. Content circles around ongoing discussions and developments in immigration rights and laws. As a public art team, their means for creation centers around the passion for the beautification of public spaces, community empowerment, and art as a healing tool. *Kevin Darmaine (New Jersey, USA) originally from Trinidad & Tobago, currently lives and works in Newark, New Jersey. He has produced paintings, murals, installations, comic books, and works on paper. In 2009, Darmanie began working with Newark’s City Murals program to create murals throughout. He created three murals with the program: “Wellwisher” at JFK School, “Reaching for the Stars” at North Star Academy, and “Kidults” at Casa de don Pedro. As well as independently creating a piece for the Urban League. This will be his fifth mural with the city of Newark. *Khari Johnson-Ricks (New Jersey, USA) is a young New Jersey based artist who is working in Newark and identifies as a painter, animator, DJ, and dancer. His work addresses the close relationships that cultures have to movement, as well as the ever changing ideals of what masculinity and manhood are. Johnson-Ricks graduated from Montclair University with a Bachelors of Fine Art. This is his first mural in the City of Newark. *Manuel Acevedo (New York, USA) was born in Newark where he has worked for many years. Manuel Acevedo's work combines projected image, wall drawing, animation, and photography to explore how light and movement shape experience. Through various media, he employs visual language in ways that transform flat, static images into active spaces of experimentation. Acevedo’s work has been exhibited extensively within the US and abroad. Acevedo has been a pioneer in the Newark art scene and has produced a large amount of work about the City for the City. *MataRuda (New Jersey, USA) is an artist, activist, and archivist who currently lives in Newark, NJ. He was born in San Jose, Costa Rica and lived in Caracas, Venezuela until he was 11, then immigrated to the USA. Using iconography from both regions, he has painted a variety of murals and paintings that empower immigrant, and overlooked communities and cultures. His work has been part of the Newark Museum, El Museo Barrio, The Painted Desert Project, and Calle 13's Multi_Viral. MataRuda currently has one mural in the City of Newark. Nanook (Maryland, USA) is a muralist and fine artist. His work weaves contemporary social issues with local history and folklore to create site-specific installations. His work has been part of the N.V Massaquoi school rebuild in West Point Liberia, The Painted Desert Project, Open Walls Baltimore, and Living Walls Atlanta. Nanook currently lives in Boulder, CO but spends the majority of his time traveling and creating work around the world. This is his first mural in the City of Newark. *Nina Chanel Abney (New Jersey, USA) is a painter based in Jersey City, NJ whose studio is currently in Newark. As of late, Abney has been exploring collage, layering words, arrows, and faces in a bright mix of references. Abney received her BFA from Augustana College, Rock Island, IL, and her MFA from Parsons School of Design New York, NY. Abney’s work has been exhibited throughout the world including: Detroit, MI; London, UK; San Francisco, CA; New York, NY; Washington, D.C.; Raleigh, NC among others. Her work can be found in the collections of the Brooklyn Museum, Corcoran Gallery of Art, Girls’ Club, and The Rubell Family Collection. Sonni (New York, USA) was born in Buenos Aires, Argentina, where he studied graphic design and worked as an Art Director for animation and film companies. He currently resides in Brooklyn, New York. He works with different mediums that include paper and pencil, illustrator, acrylic on canvas, and wooden sculptures. Yet, his passion is to paint murals in public spaces, finding that dialogue with the public through primary colors and playfulness. This is his first mural in the City of Newark. Tatyana Fazlalizadeh (New York, USA) is an African-American and Iranian artist originally from Oklahoma. She has recently been acclaimed for her project, “Stop Telling Women To Smile,” which has had an impactful national presence. Her paintings are heartfelt portraits of both herself, and people she has casually encountered throughout her life. Fazlalizadeh’s self portraits capture her strength as a woman, an attribute that originally provoked her to create the “Stop Telling Women to Smile” project. Zéh Palito (Brazil) is an artist who is living and working in Limeira -São Paulo, Brazil. His practice involves the potential of urban non-spaces, creating large-scale, site-specific works. His work has been shown throughout the world in places ranging from Argentina, Belgium, Chile, Spain, Germany, Poland, United States, South Korea, Thailand, Zambia, and others more. This is his first mural in the City of Newark. Rebecca Jampol is an arts educator, gallery director and independent curator based in Newark, New Jersey. Graduating from Rutgers University-Newark in 2008, she became the driving force in a myriad of cultural and educational initiatives including: Jajo Art Gallery, Glocally Newark, The 239 Collective, Rutgers Future Scholars "I am" Program; The NewWalls Newark Public Art Conference, The Gateway Project Public Art Initiative, and Portals, Newark. Ms. Jampol and her many endeavors have received press from a bevy of outlets including The Wall Street Journal, The Huffington Post, Hyperallergic, Juxtapoz Magazine, Forbes Magazine, ArtNews, BlouinArtInfo, VICE, Vanity Fair, WhiteHot Magazine, and The Star-Ledger. Lunar New Year (LNY) is an artist, muralist and interloper defined by borders and hybridity. His artwork and murals question politics, injustice and cross-cultural identity by making visible the stories that are often left invisible and silenced. LNY is also an educator, organizer and public speaker for such projects as Young New Yorkers in Brooklyn, Yollocalli Arts Reach in Chicago, and City Without Walls in Newark. He was raised within the duality of Ecuador and the USA, currently living and working in Newark, NJ, as well as around the world.